Section 1, “The Glory Days”, covers the period beginning with the earliest known information on Nihon Seiko, and continuing until the sale of Unitron USA in 1975. Section 2, “The Transition”, begins after the sale and documents the restructure of Unitron USA and the introduction of new telescope models in an effort to compete with new technologies and the Chinese market. Section 3, “The Demise”, addresses the timing and rationale for the closure of Nihon Seiko as a manufacturer and marketer of astronomical telescopes and accessories, and the decline of Unitron USA as a major astronomical supplier. 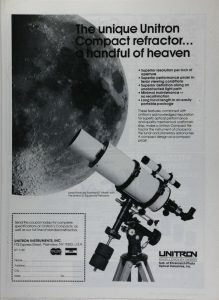 By the Spring of 1977, the company was now listed as Unitron Instruments and Ehrenreich had just introduced the 3 inch compact refractor. The large full-page advertisements were replaced with smaller advertisements featuring their under $200 scopes…the 80mm spotting scope and the 2 inch Alt-Azimuth refractor. The full-page advertisements that did appear featured Galileo and the 2 inch Unitron, and Copernicus praising the benefits of Unitron’s Astrophotography capability. You were more likely to find Unitron packages listed in S&S Optika and R.V.R. Optical advertisements. 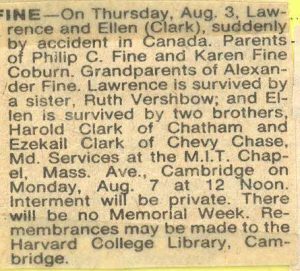 Quite tragically, both Lawrence Fine and his wife Ellen were killed in a plane crash near Rimouski, Quebec, Canada on 3 August 1978. Lawrence Fine was flying the plane. The accident occurred in bad weather. They are buried at Sharon Memorial Park, Sharon, Massachusetts (Beersheba Section, plots 75-1 and 2); their funeral service was held at the M.I.T. Chapel. In 1981, Nippon Kogaku, the maker of Nikon cameras and microscopes, acquired Ehrenreich Photo Optical Industries and as such, Unitron USA became part of the Nikon Instrument Group. Unitron USA continued as part of the Nikon Instrument Group for five years at which time (1986) it was taken private by a management led buyout. 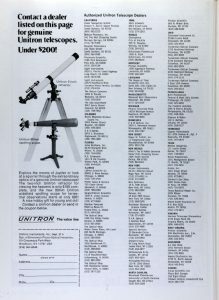 In 1983, The Leisure Products Division was established as a division of Unitron USA with the goal of bringing the same “excellence by design” to the area of optics in the consumer market in addition to its high quality telescopes. The Leisure Product Division represented a new and exciting line of optical products designed to enhance the needs and enjoyment of the consumer market in the product lines of binoculars, telescopes, theater glasses, magnifiers, hobby microscopes, sports glasses, as well as many other fine quality optical products.